In his early twenties, Mozart started three operas he never completed. Two are Italian comedies, and the third is a German Romance. Each was a tantalizing hint of what might have been. 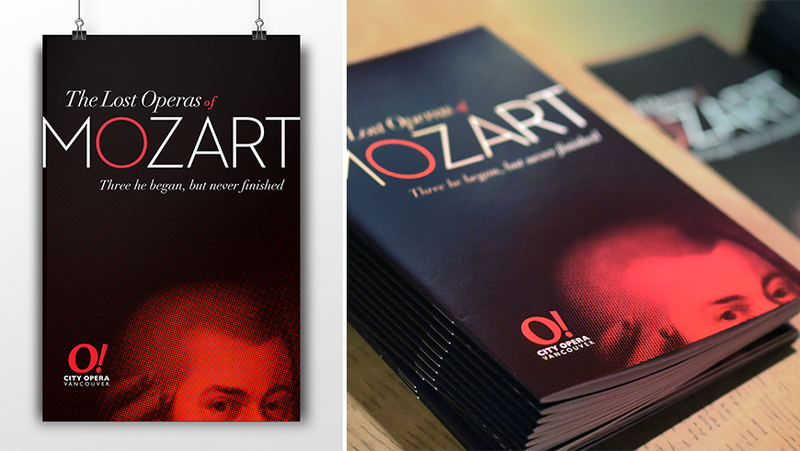 In October 2016, City Opera Vancouver offered a Canadian event premiere: three forgotten Mozart operas in one evening of wonderful theatre, delightful music, and original exploration. 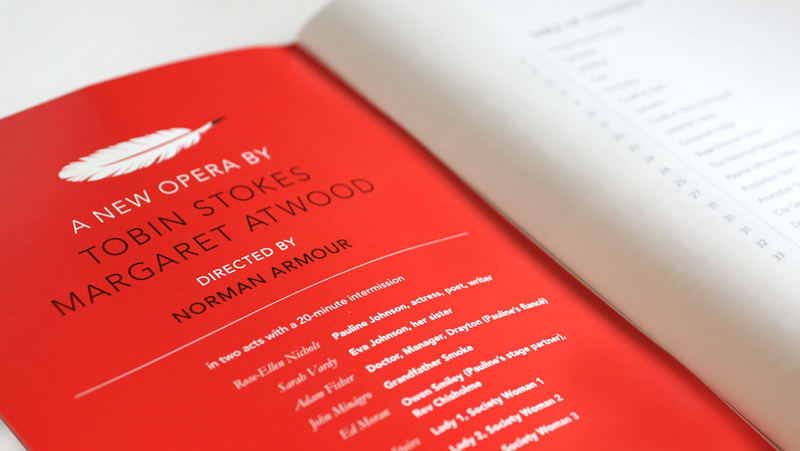 In keeping with City Opera’s colour scheme of red, white and black, we wanted the branding to be both simple and cheeky. Mozart is peering back, in order to get a glimpse of his unfinished works. The red O is a reference to this innovative and unique Opera company. 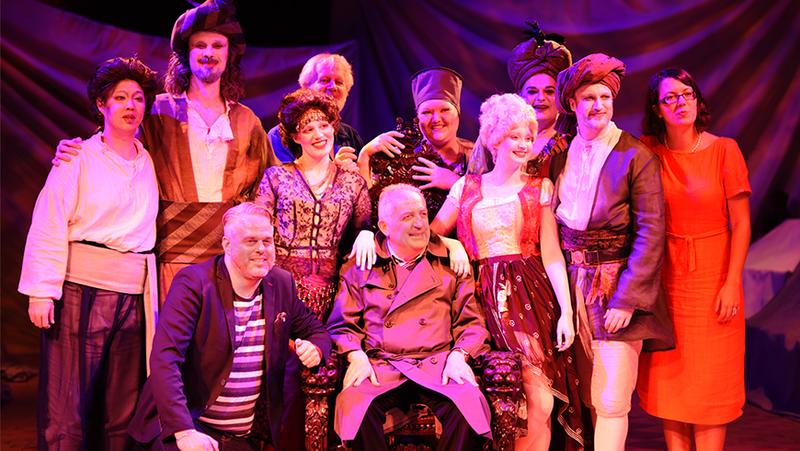 Cast of Lost Operas of Mozart with Director Alan Corbishley, Conductor Charles Barber (back) and Bramwell Tovey as The Impresario. City Opera Vancouver premiered Pauline, a chamber opera based on the life and final days of Canadian writer, poet, and actress Pauline Johnson. The music was written by Tobin Stokes, and the libretto by Margaret Atwood. “Pauline Johnson (1861-1913) traveled across Canada, the United States and Great Britain giving readings of her own work when such independence was rare and remarkable. She was the child of a Mohawk chief and a Quaker Englishwoman, and torn by loyalty and ambition. Pauline lived her last years in Vancouver and died a terrible death of breast cancer, treated by crude surgery and morphine.”(read more about Pauline). 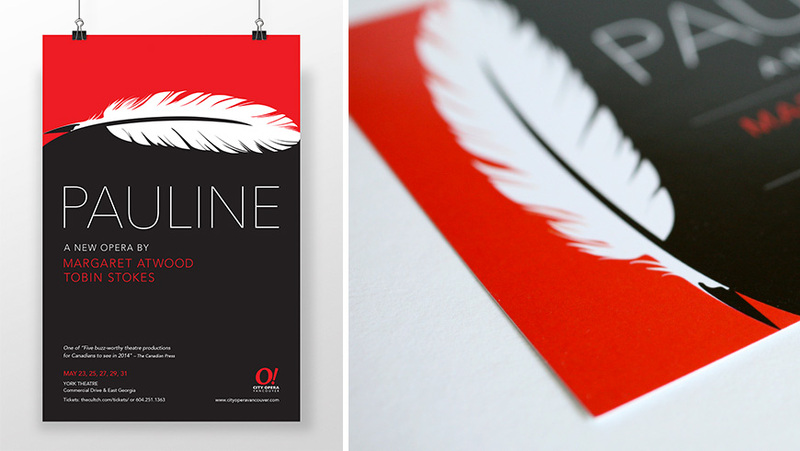 After researching Pauline’s story and working closely with the City Opera Vancouver board of directors, we landed on a simple yet bold identity in the shape of a feather quill, symbolizing both Pauline’s Mohawk background and her life as a celebrated poet and writer. The duality and contrast of the red and black celebrate her mixed heritage as well as the juxtaposition of her vibrant life with her difficult death, which is the main storyline of the opera. The world premiere of Pauline was given at the York Theatre in Vancouver, on 23 May 2014 to critical acclaim. All five performances sold out.